is this really a ship our is it a plane with out its wings. 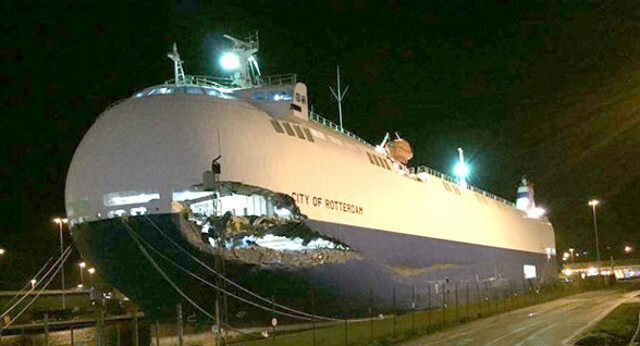 it crashed into a rollon rollof ship in a storm, its a car transporter. What a monster, very interesting shape, what would be the reason behind it's shape never seen a ship like this before. 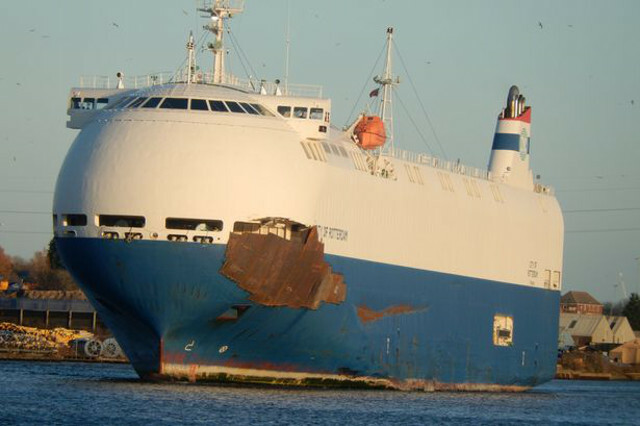 probably maximum load for minimum exterior size, especially as she is fitted with multiple mezzanine floors, as she is a car transporter bringing new cars into Europe from Asia and the far east................all adds up to maximum pay load, with crew accommodation on the top deck, I presume. I suppose if you think about it cars are not that heavy and full empty space inside them, equivalent say a cargo of pallets are stacked pretty tightly at perhaps 1 Ton each would weigh a lot more. There are any number of similar strange looking vessels which look totally top-heavy. Not all as streamlined as this, but all car carriers. Below in the link you will find a few photos of the damage.